Feb 5 - Use your patterned paper to the max! Ok Ladies...we all have patterned paper laying around, don't we? Well, this week, I challenge you to think up off of and away from the table for how to use that paper! Confused? I made a card using this sheet of patterned paper. It is double-sided, so the more solid colored backside is what I used as a base. I took the patterned side, and cut it apart, using my craft knife (on a self-healing mat of course). Then, pop-dotted the inside parts of the flowers. Added a brad and voila! A little chipboard for the sentiment, and a journal page for grins, and I had a cute card in no time flat, using less than one whole sheet of paper. Of course, since it's a card, even though I got double-duty out of it (by using both sides)...I still had lots left over to make more cards, or add some pizazz (is that how you spell that?lol), to a LO. Can't wait to see what you come up with! Don't forget to post your creations here on this thread so we can all be inspired by your awesome talent! TFL!! Re: Feb 5 - Use your patterned paper to the max! Oh I just love the rich colors and patterns! The lined journal block anchors it all so well! 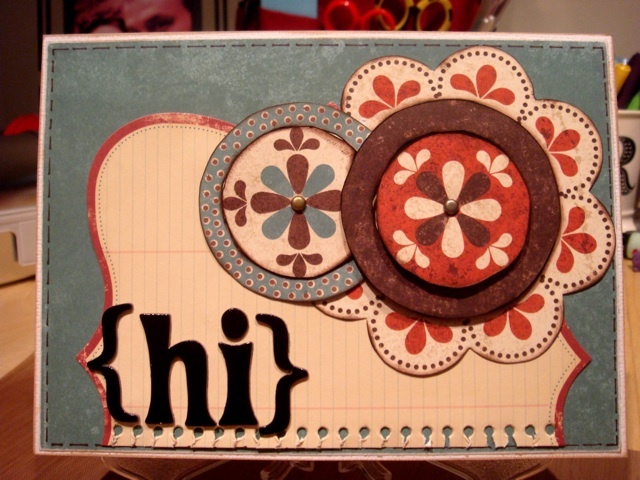 I am still nervous about mixing patterns but its not as scary on a card as a layout! Gotta go grab some of my pp scraps and play around! Thanks karen, be sure to post your creation here, so we can all ooooh and ahhhh over it!! Working on it, making the most of this free time, lol.!! I made 2 card's but for the sketch's, can i post it when i put them up or shall i just post them now & the sketch's later?? Becoz i have drawn up the skletch's for the next couple of week's, i just have to make the page's/card's, know what im on about? Yeah, you do what feels right to ya sister! Long as we get to see them, cuz we knoooow they'll be great!!! Oh i posted them they are the sketch cards for 8th feb, you want me to post them here too? They are great! I saw them!!! LOVE Them!! !